Facelock App coming Q2 to Symbian Phones – unlock your phone…with your face! We saw Facelock demoed in Nokia World 2010, as part of a developer challenge to produce the app during Nokia World. Subsequently it won the competition. Facelock basically allows you to unlock your phone with your face. Very futuristic and a neat alternative to touch unlock. No need either to remember lock screen password. Hopefully it will have a high accuracy rate. I’m loving the fingerprint reader on my laptop. Swipe to log in, enter sites with fingerprint linked passwords and open certain apps with certain fingers. Something along those lines would be cool with faces. Happy face for gravity, sad face for Nokia Browser or Nokia Social App :p.
Antonio tips us that it’s coming soon. Q2 for Symbian phones and it will be available free. Antonio has even translated the press release for us. His post is below. Nokia Facelock: it has been under development for quite some time, and it will be released in Q2 this year for all new Symbian phones (Nokia N8 and newer Symbian^3 devices). FREE APP will be available on Ovi Store soon. According to Nokia Brasil, they are just sorting out some things before release (like face recognition when you cut your hair or grow a beard). Description? It unlocks the phone when you look at the front camera. No need to press any key combination or password. “Take good care of your cellphone, because it will now be able to recognize you. Try to imagine a day when numeric passwords, keys, key locks, cryptography and codes will not be necessary, because the only “password” you’ll need will be your own face. For most places, this face recognition system may be far from happening, but for protecting your pictures and messages on your smartphone it will be soon, very soon, possible. 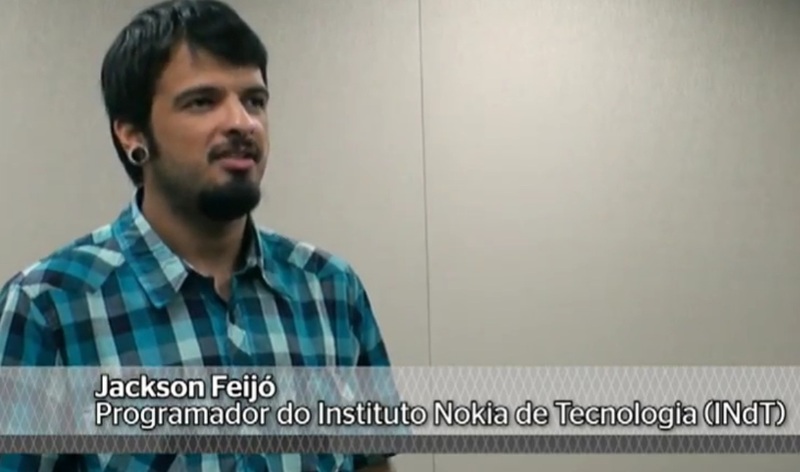 The INdT (Instituto Nokia de Tecnologia or Nokia Technology Institute) has developed, in Brazilian territory, a technology that is different from everything you have seen when it comes to smartphone intelligence: the cellphone’s owner recognizer, Facelock. The purpose of this app is to replace the old unlock code, which people use to protect their phones from curious people, using biometric recognition. Think that, instead of typing a code, you just stare at the phone looking at the front camera and you’ll be recognized. It’s that simple. In order to work, the app will need a cellphone with front facing camera and the Symbian^3 OS, which means that it will initially only be compatible with the new phones such as the Nokia N8 and Nokia E7. You must be wondering from where did we take this genius idea. Everything started with the worldwide “Make my app” contest to stimulate developer teams into thinking about apps they would like to see on the phone. The one able to create the product in 36 hours would win US$100,000. Choosing the winner was not easy between more than 7000 received projects, but the INdT team managed to make it and today Facelock is a reality.